Buhari attends Juma’at prayer in Aso Rock – Royal Times of Nigeria. 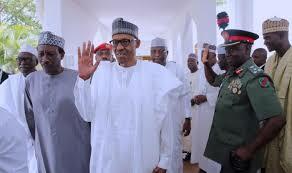 President Muhammadu Buhari on Friday joined the Attorney General of the Federation, Abubakar Malami, the National Security Adviser, Mohammed Babagana Monguno, and other officials to attend the Friday Juma’at prayer. At exactly 1:30pm, Buhari arrived the national mosque alongside his aide-de-camp, chief security officer, personal physician and State Chief of Protocol.